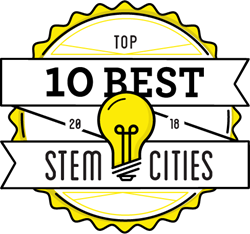 New data-driven list ranks the best small to midsize cities for workers in STEM fields. STEM-related jobs are expected to increase by 13 percent through 2025, compared to 9 percent for non-STEM fields. The national average salary for STEM jobs is $87,570, nearly twice the average of $45,700 for non-STEM occupations, according to the Bureau of Labor Statistics.